Graduation season is upon us and it’s time to start looking for the perfect graduation announcements to represent this triumphant milestone. 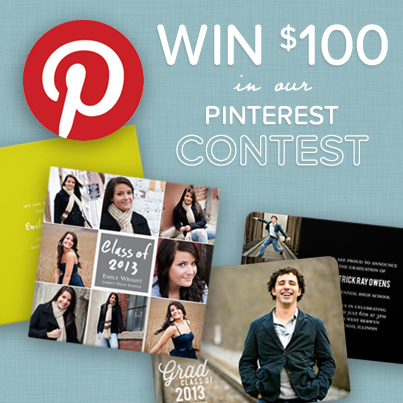 Pear Tree Greetings is hosting a Pin it to Win it Graduation Pinterest Contest where you can win $100 towards our graduation collection! All you have to do to enter our Pinterest Contest is create a Pinterest board titled “Pear Tree Greetings Graduation Announcements” and pin a minimum of 5 of your favorite designs! Enter your board by adding the link as a comment to this pin. Five lucky winners will be drawn at random. Contest ends 4/28/13 and winners will be announced 4/29/12. Start pinning your favorite graduation announcements!